Last year, Kindergarten teacher Bethene Songer from Western Hills Elementary approached her building principal with the idea of using Facebook to engage her parents. After discussions with School Community Relations and technology department, they set out to pilot the use of Facebook to engage parents. The following questions and answers are provided by the team involved in the pilot, which included: Bethene Songer, Kindergarten teacher at WH; Beth Thornton, principal at WH, Brian Abeling from Technology. Q1. Why Facebook? Why not just a regular web page? Bethene Songer: This is a tool that most parents know how to use and use on a consistent basis. Why struggle to make parents visit your website or blog when you can meet them in a place they already visit online? Q2. 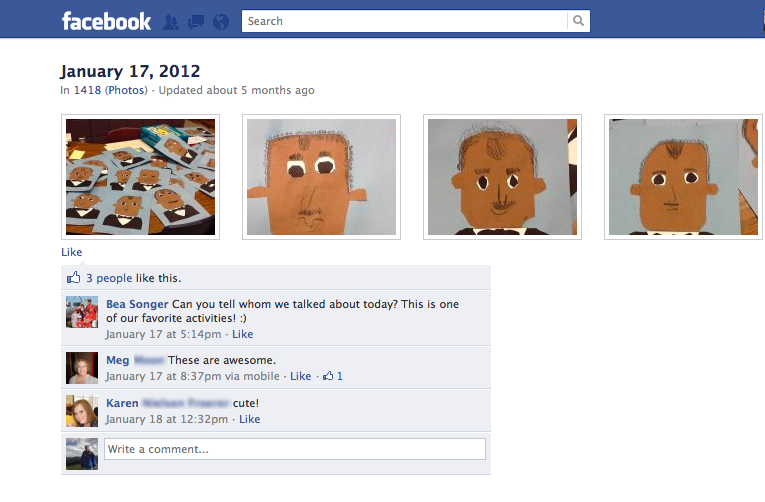 When did you start using Facebook in your classroom? 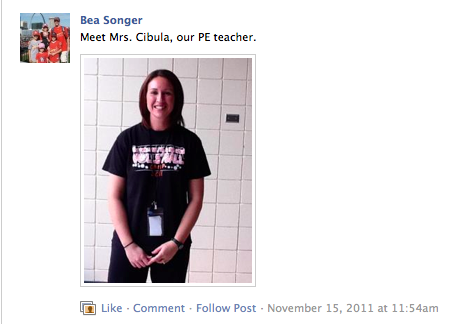 Bethene Songer: I asked my building principal about the idea during the summer. After conversations with my building principal, school community relations and technology, I started the pilot just after the start of last school year. Q3. What did your principal say to this request? Bethene Songer: The principal was supportive and she wanted the pilot to proceed. We then proceeded with talking to School Community Relations and technology, to discuss what was needed in order to proceed. Q4. Did you talk with your parents about the idea before proceeding? Bethene Songer: Yes. Last year, I had each family fill out a survey about their comfort level with Facebook during Open House. 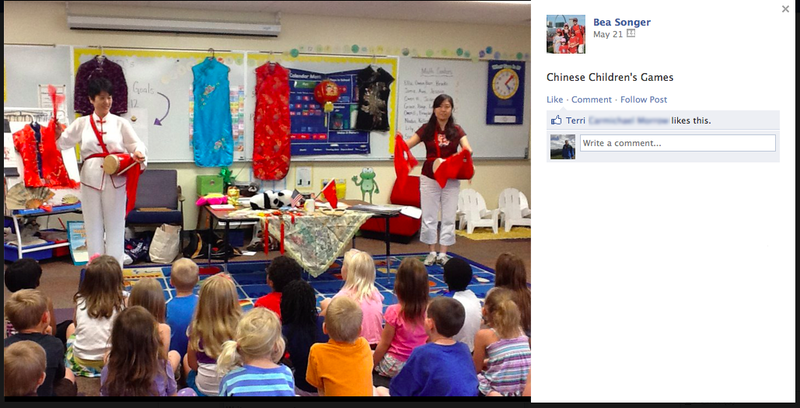 This school year, I conducted this during my home visits at the start of the school year. Q5. Did any parents object or opt-out? Bethene Songer: Yes, I did have one family opt out. Q6. How did you set this up? Did you create a new generic Facebook account or did you use your own existing Facebook account? Q7. 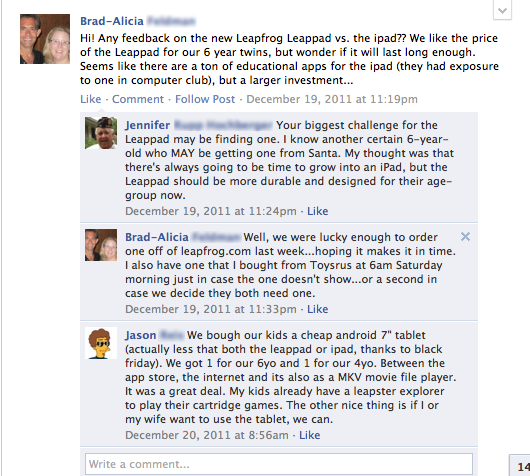 Since you are using your own personal Facebook account, do you have to be friends with your children’s parents? Bethene Songer: No… you ARE NOT friends with them. Instead, you are both members of a closed group. This means that parents CAN NOT see your regular Facebook posts and/or pictures. Q8. Do students actually have accounts or is this something you use just with parents? 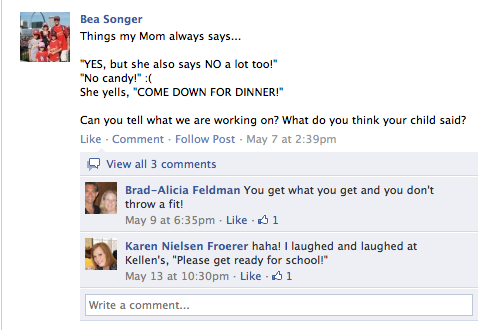 Bethene Songer: Students do not have accounts – I use Facebook as a way to engage parents. Q9. Did you ever have to delete any posts from parents? Does it happen very often? What other types of problems do you encounter? Bethene Songer: First of all, let me say that when we set up our group, I made sure, as the administrator, to be notified (email) anytime something was posted on the page. I believe that is extremely important detail. I checked email regularly and Facebook, typically at the end of the day. I only had to remove one post from our group last school year. Once it was removed, I emailed the parents and informed them that I had removed their post and why. I also set up pictures the same way as posts. If anyone tried to tag a picture, an email was sent to the administrator to ask for permission. Permission was always denied. Parents knew this, but they still tried. If the picture was only of their child, I would personally email the photo to the parent. Another issue that arose was parents posting pictures to the site….great idea/involvement, but unfortunately we had that one parent that did not want their child on FB. I emailed the parent and let them know I would be deleting a few pictures and why. Everyone was very understanding. Q10. What types of things do you post for parents? What types of posts or content were the most popular and got the most reaction from parents? Bethene Songer: I posted; Pictures, Reminders, Videos, Events, Graphs, Kids quotes or stories, Volunteer Opportunities, Projects, Special Classroom Activities, Sharing Free Apps/websites, Des Moines Register Articles (about WH), Guest Visitors (Authors and Books), Pictures of Staff Members, Field Trips Pictures/Info. This group of parents loved the pictures and reminders. TIP: Remember to ASK QUESTIONS, not just post information. Q11. How often do you post on to your Facebook group? Bethene Songer: I made sure to post at least once a week, but found myself wanting to share a lot more (3-4 times a week, depending what was going on at school). Q12. How many parents have joined your Facebook group? Bethene Songer: Last year, I had 25 out of 26 kids were represented by one or two parents. This year, I have 24 out of 26 kids represented by one or two parents. Q13. At the end of the school year, what type of feedback did you receive from parents? Bethene Songer: Extremely positive. Parents loved the reminders and photos. One parent noted that it was a great tool for her to get her child to talk about the day, many expressed how the pictures were a great way to see into the classroom, and many said the reminders “saved” them more than once! Q14. Is this something that you will be doing again this year? Bethene Songer: Yes, I am planning to create a new group for this year’s class. Q15. Is the building principals supportive of how the pilot turned out? 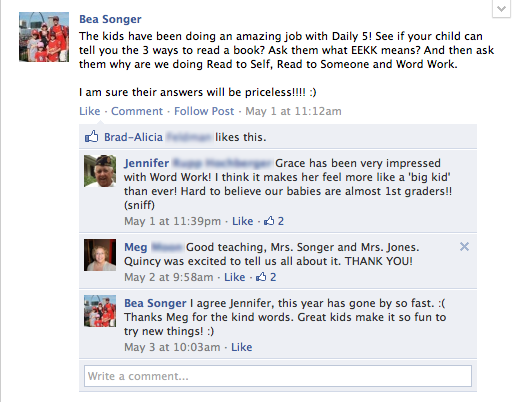 And do they support or are willing to let additional teachers use Facebook for parent engagement? Beth Thornton: Yes. In fact, I had additional teachers that heard about the pilot and also wanted to start using Facebook in their classroom, which started this current school year and I’m sure we’ll have additional staff coming soon. Q16. What is the district’s reaction to all of this… will they continue to support and allow the usage they allowing the usage of Facebook for parents? Brian Abeling: We are allowing the usage of Facebook for parent engagement purposes as long as the staff member has approval and support from their building administrator. In addition, we are in the process of developing guidelines for staff members who would like to explore this approach. Q17. 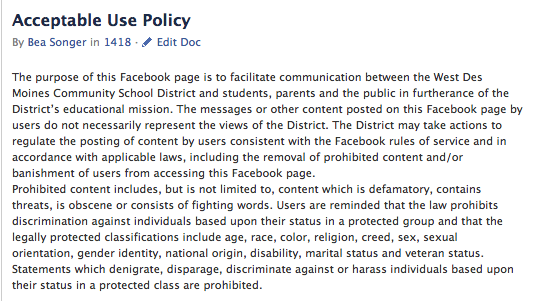 Our School Board recently approved a policy related to social media use – isn’t this in conflict with that policy? Brian Abeling: No, it is not in conflict with the policy. What’s featured in this article is using Facebook as a communication tool with parents – and does not involve teacher to student interactions through Facebook. Q18. Does this mean that teachers can now use Facebook as an instructional tool in the classroom with students… meaning that we can “friend” our students? Brian Abeling: No. 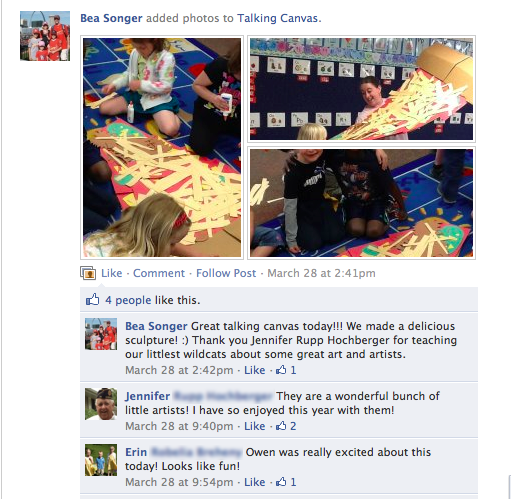 The example featured in this article is about teacher to parent communications – and did not involve teacher to student interaction via Facebook. The district does not support or encourage the use of Facebook for student engagement, however, we have other tools such as Moodle, Edmodo and others that are encouraged. Q19. I followed your links, including the Kindergarten teacher from Texas and his examples that you followed. 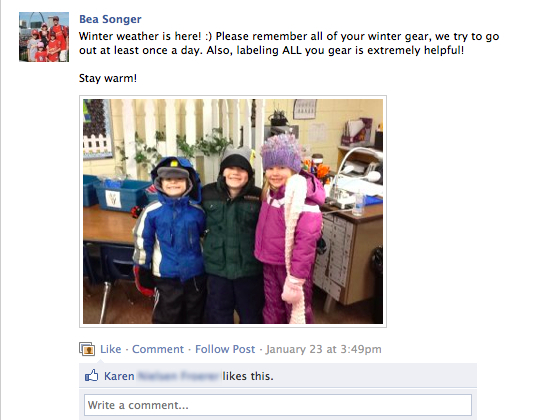 It turns out that his district eventually shut down his use of Facebook for the classroom…. did you see this? and is this factored into your thinking? Brian Abeling: Yes, we have seen and discussed this. In fact, when his district asked him to shut down his Facebook group is the same time we went forward with our first pilot. We understand there are concerns about using social media, but our goal is to identify when and where its usage needs to be embraced. In addition, our district and every school were already using Facebook – so it’s a nature next step to test Facebook as a school to home communication tool at the classroom level. 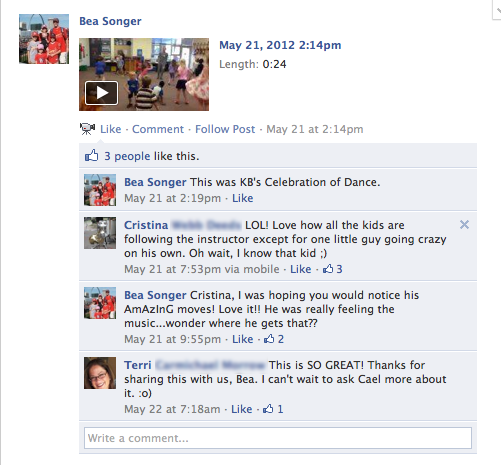 Posting a quick video clip of an activity gives parents an “eye” into classroom and helps them connect with their kids. Be sure to share your instructional strategies with parents – so that can help out at home ! This is the sample acceptable use policy provided by the district. 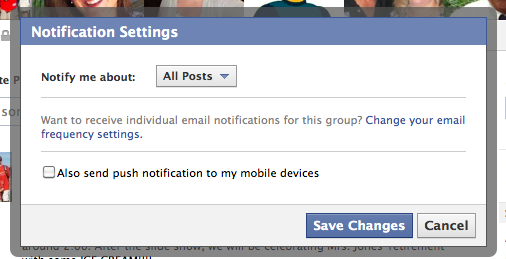 TIP: Turn on the notifications feature – so you’ll get notified when a parent has posted a comment or question. 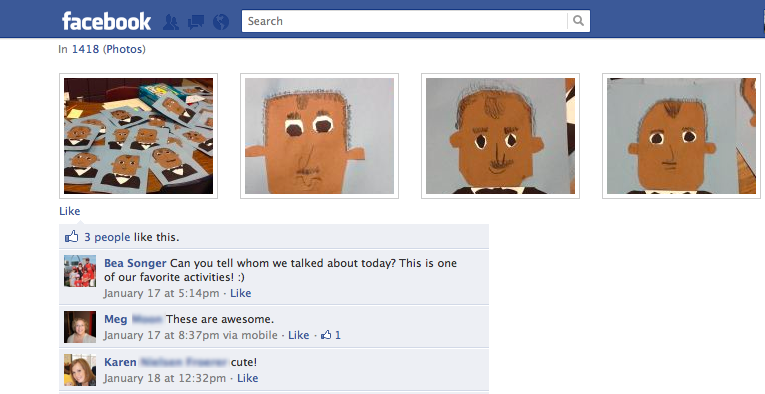 Facebook is a great way to introduce your parents to new staff members that your children will interact with! This entry was posted in for Parents, for Staff and tagged bethene songer, classroom, education, facebook, kinderchat, kindergarten, matt gomez, schools, social media on December 26, 2012 by Brian Abeling. 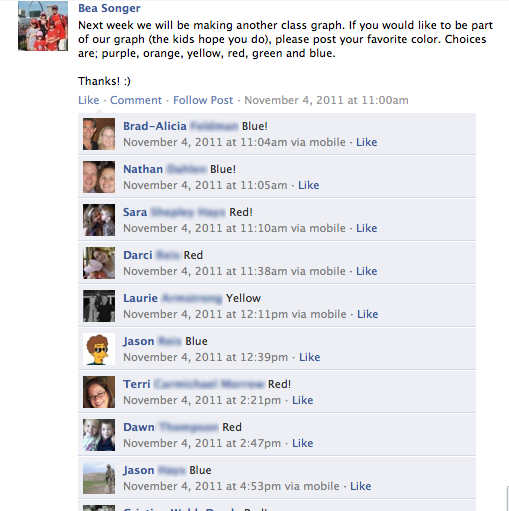 Do you have a document or slide show with your information about creating/managing a class Facebook page? 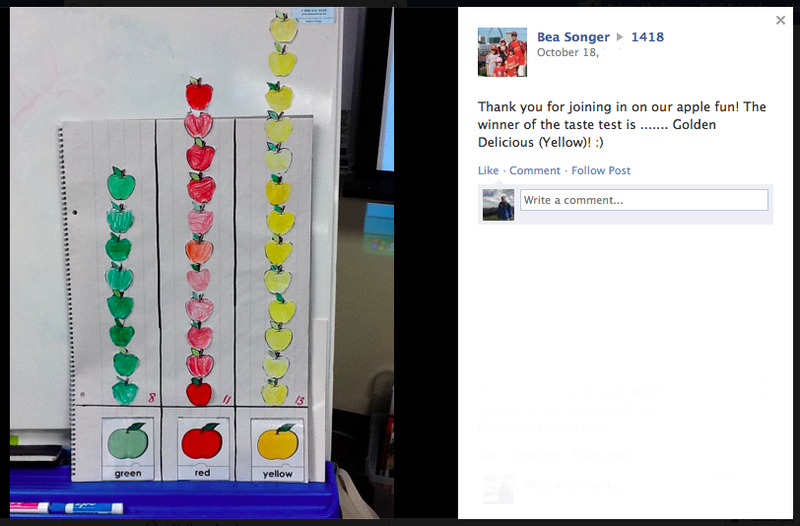 Wow, I love this idea and am going to propose it to my principal for next year. I do have a website I keep up 2-3 times a week, but I also find it isn’t used as often as I’d like. What kind of questions did you ask your parents in your survey? I am wanting to start this with my preschool classroom and am trying to figure out how to go about it. If you have an example of the survey you used, I would appreciate seeing that. Thanks.